It wasn’t actually a brought-to-you-by-Sesame-Street-esque article (a little more risque), but having a name that starts with a “J,” I was glad to get some play! Jacqueline, Jaycee, Jeanie, Joan Jadyn, Jane, Jackie, Jasmine, Julie, June, Janet, Jeanette, Janell, Janice, Jana, Jamie, Joan, Jazzy, Jae, Jeena, Jennifer, Jenny, Jade, Jessica, Jewel, Jezebel, Joanna, Joelly, Jocelyn, Joleen, Joy, Juanita, Judy, Jovan, Jill, or for boys there are Jake or Jacob, Jackson, Jason, Jeff, John, Jesus, Jarrett, Jeremy, Jedi (I know a few), Joey, JoeJoe, Jerry, Justice, Joshua, Justin, Julian, and ETC! 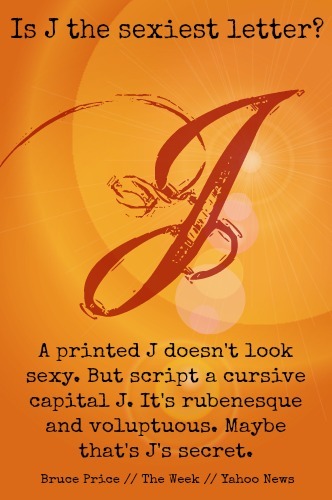 Anyway, the Yahoo-news article was a little bold, but suggested “J” might be the sexiest of all letters and I am just saying – maybe that is true. 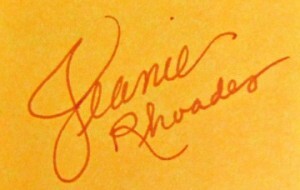 I make my “J”s a lot like this one, especially if I am feeling particularly swirly! My sis in law Jo (short for JoAnne) once was married to Julian, thought mostly he was called Jr. They named their girls Jamie, Jessica and Janelle. I always thought it was fun that they all started with a J.